Ductless heating and cooling systems are taking the HVAC industry by storm. In some ways, they're nothing short of revolutionary. But the newness doesn't mean you or anyone else should be wary. They are technically heat pumps, but these new systems easily keep you warm when the winter on the east coast becomes brutal and it will keep you nice and cool when the summer is unbearably hot. Let's be honest, we all know how unpredictable the weather gets in the Bucks County/Philadelphia area! A typical heat pump can't warm your home when temperatures drop in the 40s, 30s, or below, but a Mitsubishi ductless system shrugs off those cold temperatures and keeps on working, even if it's -13 Fahrenheit outside. This system is ideal for all types of weather conditions, so you'll never have to worry about your system not being able to keep up with what's happening outside. With a new ductless system in your home, you not only get comfort and efficiency for you, but your home is also more appealing on the market. All homes have heating systems, and most also have cooling. 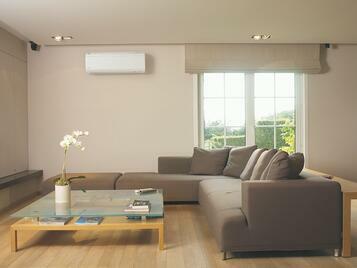 But with a Mitsubishi ductless system, your home boasts the most advanced climate control on the market today. All of the issues that most home owners deal with, such as cold spots and allergens blown around the room, are a thing of the past. These new efficient systems automatically adjust for temperature irregularities, deeply filter the air to remove more allergens, prevent cold blasts from vents, and even keep you toasty warm if the temperature outside dips well below zero. Older homes with great architecture are at odds with most traditional heating and cooling options. But that's not the case with a Mitsubishi mini split heat pump. The unit outside is much smaller than most systems, and the units inside take up very little space on the wall or ceiling. There's no cutting into any part of the home to install vents and ductwork, aside from a small, 3-inch hole through the wall. With a mini split, a historic home will retain more of their authentic value while also keeping the home as comfortable as it should be. It's been a sad reality that the more comfortable you are indoors, the more likely you are to spend a fortune to keep your home that way. Well that doesn't have to happen if you have a ductless heat pump! Mitsubishi has numerous Energy Star rated systems designed to combine comfort with relief from high energy bills. Your home could be the strongest contender on the block that that kind of combination, regardless of its square footage. Want to impress everyone? Take a look at Mitsubishi's simple maintenance regimen and warranty. There's no filter to buy every month because the filters are washable! And you can keep the outdoor unit clean with a garden hose and a few quick checks. Newer technology doesn't always come with the best warranty, but that's not the case here. Mitsubishi offers 5 years of protection on related parts, and 7 years of protection on the heat pump compressor. Protection against unexpected costs is value for anyone! Ductless heating and cooling units are high-tech, and more efficient than you ever thought an HVAC system could be. You can install one for a single area, or rework your home's entire heat and air from top to bottom. The decision is all yours. Mitsubishi took the best that heat pump technology had to offer, and perfected it for a new generation. Your home has never looked more attractive than with a new ductless system to keep you and your wallet more comfortable. Get a new Mitsubishi ductless system installed in your home today! To learn more click our link below, or give us a call a 215-245-3200.